All new clients to the studio require an assessment session on a 1-2-1 basis with one of the Pilates Body Aligned Teachers. This assessment is £25, and is combined with a FREE trial beginner class at the Studio. We offer a large range of classes for all abilities, strengths and personal development. We have four pilates teachers at the studio, each with their own style and way of teaching. We encourage clients to try out different classes to be able to gain a greater understanding of their own movement and of the Pilates principles. To book classes, click on the link to the right. You can either pay for the classes when booking, or book and pay once you arrive at the studio. Our discounted block booking payments for 4 or 10 classes can be booked online, but need to be paid for at the Studio. Click here to find out more about private Pilates sessions and sessions designed for your own individual requirements. We run beginner, intermediate and mixed ability classes so there is plenty of scope to find the right class for your ability. Using a knowledge of the ABCs, Alignment, breathing and Connecting, individuals are encouraged to work to their own ability level in class whilst being supported by the teacher to ensure they are able to make the most of the small class tuition. NEW clients are required to complete an initial 30 minute 121 assessment covering the ABCs. The cost is £25 and includes your first class. The Pilates Arc or Spine Corrector class is suitable for most people. The Arc is designed to support the spine, correct spine curvature and to challenge the centre of our body, the abdomen, the back, and the shoulder muscles. 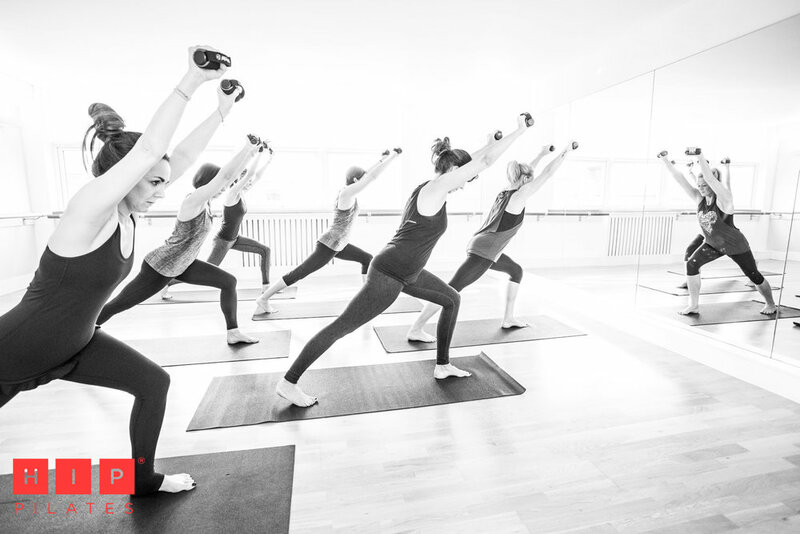 The class is aimed at strength and flexibility of the core, from head to toe. MOTR (Movement on The Roller) - this 60 minute workout improves your strength, balance, agility, cardio. 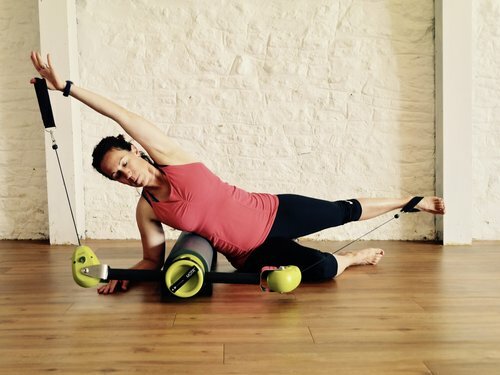 The MOTR is a hard foam roller with a weighted pulley system attached to one end, every session is different and challenging. Sit on it, kneel on it, jump on it, lie on it, stand on it! Spaces are limited to four places only per class. S.E.A.T (Stability, Endurance, Abdominals, Toning) This class provides a 60 minute total body resistance workout Cardio - Core - Strength - Balance with the importance of attention to correct use of ABCs. Suitable for all levels and abilities this class also targets muscle groups that traditional techniques and equipment can’t reach. Spaces are limited to 4 people per class. Use your Pilates ABCs to work deeper, stronger, progress and adapt movements with the Reformer Class. Pilates Reformer sessions provide the challenge of resistance and support to gain greater results. Sessions last 30 minutes or an hour, are suitable for mixed abilities and can be done on a 1-2-1 or a group session of 3. Spaces are limited to 3 only per class. A fun and safe 30 minute class for the older client, performed standing or sitting, at a slower pace. We focus on improving your balance for fall prevention, improving flexibility and posture. Spaces are limited to 8 maximum. Healthy Bones class integrates Pilates, strength training, functional movement and rehabilitative exercise to improve the health and longevity of your bones and joints. The class is open to all abilities and good for osteoporosis. MELT Method techniques assist you to bring your body back to its' ideal state of alignment, to reduce excess stress and strain before you start to exercise. Applying MELT to Pilates improves alignment, stability, mobility, the foundations of the Pilates Method. This allows for easier performance of the Pilates exercises with greater co-ordination, ease and flow. MELT moves can be used to prepare the body to execute the Pilates exercises or as a prop to modify, enhance or assist exercises.